Are you an Apple Mac, iPhone or iPad user looking to track your personal finances? Banktivity might be just what you need. While Quicken is a top-rated personal financial management system that tracks your income and spending activities, and monitors your financial well being, it is best for Microsoft Windows users. Banktivity is a robust financial tool that aims to win over Mac users with daily updates on everything from your net worth to property value, but is it the right option for you? In this Banktivity review you’ll discover everything you need to know to make the right decision. Do you Struggle To Keep Track Of Expenses? 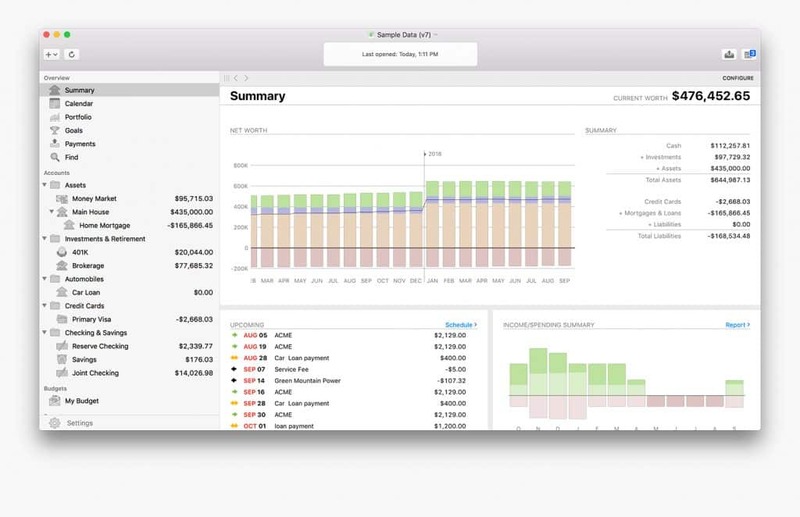 Banktivity is a viable alternative to Quicken 2018 for Mac owners who want to get a better grip on their finances. The Banktivity software makes bill paying, expense tracking, and budgeting easy for individuals. 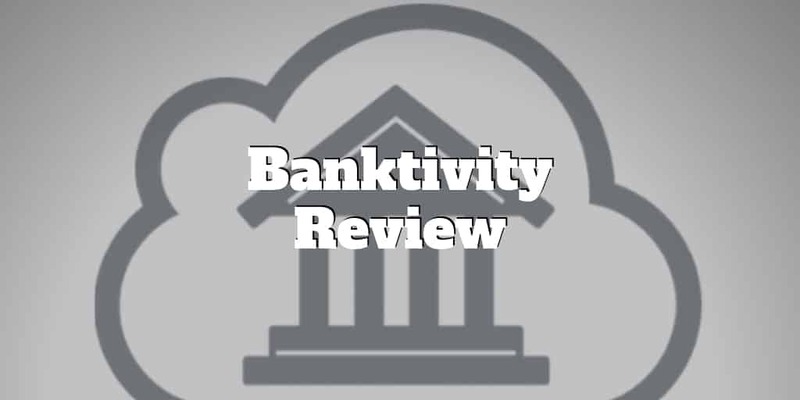 If you ever used Quicken on Windows and switched to a Mac, chances are Banktivity will be more user-friendly because it is exclusively designed for Mac OS. Banktivity simplifies data imports from Quicken so that you can bypass some of those time sinks associated with other budgeting apps. However, once you import your financial data to your Mac, you must take additional steps to enter it into the appropriate categories on Banktivity. You can then sync your PC to your iPhone or iPad with a free app so that you don’t have to enter everything more than once. Unlike Quicken, which is a subscription-based service, Banktivity charges a one-time fee – though you must purchase software upgrades too. Some additional optional functions also have associated fees. To get started with Banktivity, you must enter financial data from your records or from the program you were previously using. Banktivity can then get started managing your money. It will track your investments, sync to your mobile devices, can handle multiple currencies and also export reports easily. Banktivity offers a full menu of features that will likely cover most, if not all, of your financial management needs. Pro Tip: The debt and loan management tool tracks your principal/interest ratios and adds loan payments into your monthly budget. You can also set a minimum balance on any of your accounts, link your Banktivity account to your financial institutions, and add notes as needed. The calendar shows you all of your real-time data at a glance, including your current account balances, your transactions as they post, your scheduled payments, and your investments’ latest figures. The calendar feature is customizable according to which accounts you would like to post and which you want to exclude. This feature lets you submit your payments electronically once you set it up for your accounts with your banks. In case of money emergencies, it is simple to cancel a pending payment. At the heart of your Banktivity budget are those predictable events such as payday and bill pay. When you enter other income and expenses, it’s a cinch to display graphs and charts that offer a full view of your financial situation. The Category Budgeting feature helps you plan up to a year in advance, setting goals for big purchases or savings. With the popular Envelope Budgets option, you can create a virtual envelope for each recurring payment, for your various income streams, and for each expense, such as groceries or eating out. When you import transactions, Banktivity notifies you when transactions match others already in the system, helping you to avoid duplicates that can affect the accuracy of your balances. For banking data imports, Banktivity uses the common Open Financial Exchange file format that is compatible with many online banking sites. You can use your Banktivity browser to import your account information from Quicken, Microsoft Money, or other financial software, and you can use the “Update Everything” function to make your information current. Banktivity is great for organizing and tracking your investments, including individual stocks and bonds, mutual funds and ETFs, certificates of deposit and money market accounts, and commodities and options. You can even create a watchlist for those securities you want to keep an eye on. Plus, Banktivity’s investment feature will download quotes, generate status reports, and gather information you need for the IRS. Make sense of your financial profile with a number of report types to choose from, including a net worth summary. The dashboard displays quick stats like bank balances, outstanding bills, deposits, investment growth, and savings rate. More details are visible by visiting a specific account page. A new feature in Banktivity 7 is a tool for comparing a specific set of financials two years in a row. For instance, you can see if you really did spend more on holiday gifts this year over the previous year. With a few clicks, a report and corresponding visuals like graphs appear. Banktivity lets you export select data to a spreadsheet or, alternatively, organize reports into folders for future reference. Separately available apps enable you to sync Banktivity with your other Apple devices, such as your Apple watch, iPhone, or iPad. This feature makes it more convenient to check your budget when considering a big-ticket purchase and enter purchases mid-spree. The Banktivity Workspace displays multiple screens on a single page, so it’s easy to compare various data side by side rather than toggling back and forth. The app’s Real Estate feature provides the latest market value of the property you own. The software makes finding particular entries less time-consuming, too, by tagging each one as it comes in. You can customize and cross-reference with these tags when entries overlap. For example, those dozen roses you purchased for Valentine’s Day could be tagged both as a gift and as a grocery purchase. Also, as a Mac user, certain features are designed to take advantage of your hardware. For example, Banktivity works optimally on a 64-bit framework, and it sources your Mac’s retina display to deliver enhanced graphics. Although you can get the basic download for under $70, chances are you will need a couple of add-ons to get the most from the software. If you already own a previous version of the personal finance manager, you can upgrade to the latest version for about $35. If you want current info on your bank balances, loans, and investments at a glance, you need to purchase Direct Access, which is a tool that synchronizes your Banktivity platform with your financial institutions, investment brokerages, and other pertinent accounts. The cost for Direct Access is around $50 in addition to the initial download. Sync your Apple devices at no cost with the Banktivity mobile app. The comprehensive iPad app will set you back about $20. ✅ Excellent For Mac Users: The design is optimized expressly for Mac users, iPads, and iPhones. ❌ No Windows Version: Microsoft users will be disappointed that Banktivity has no windows version. ✅ Syncs To The Cloud: Syncs across mobile devices, including Apple watch. ❌ Add-ons Extra: Direct Access and mobile apps not included in the purchase price. ✅ Compatible With Most Banks: Connections with the majority of U.S. banks are available. ❌ No Free Upgrades: Payment is required for upgrading each time a new version is released. ✅ Holistic View Of Finances: Robust report generation providing insights of net worth, spending, income, investments, and even real estate values. ❌ No Retirement Feature: Lacks a retirement planning feature. ✅ One-Time Fee: No subscription model like Quicken but instead a one-time fee. Even though the annual subscription fee for a premium Quicken account is roughly equivalent to the initial purchase cost for Banktivity, Quicken provides free periodic upgrades while Banktivity does not. The Quicken app is free to subscribers. Besides Quicken, several other financial apps compete with Banktivity. Which one works the best for you depends on what you want to spend, the complexity of your finances, and how much time you have invest in setting up your account. Mint is a top-rated, comprehensive financial tracking app from Intuit that is free to use. The trade-off is that advertising peppers dashboard screens. Mint no longer offers bill pay or account reconciliation, but it does provide credit score monitoring and budget utilities. YNAB, which stands for You Need a Budget, is another top financial management app designed to help you make the most of your income and live within your budget. It features an accountability partner that keeps you within your budgetary parameters. It also offers online classes that teach the basics of budgeting. Acorns is a user-friendly personal finance manager that squirrels away a little savings at a time. It skims pennies from your purchases and payments by rounding them up to the nearest dollar, and it then harvests the difference and puts it to work for you. Acorns is free if you are a college student or around $12 per year if you are not. Personal Capital is an excellent Banktivity alternative. It is both a budgeting app and a robo-advisor, so if you also want your money invested automatically it’s probably your best bet. Whether you are just getting started with personal finance management or you are ready to upgrade your current platform, Banktivity is definitely worth exploring. Designed for Apple users, it is an excellent alternative to Quicken users who switched from Windows to Macs. It is free to try and comes with a 90 day risk-free guarantee so there is no reason not to give it a whirl and test drive it. 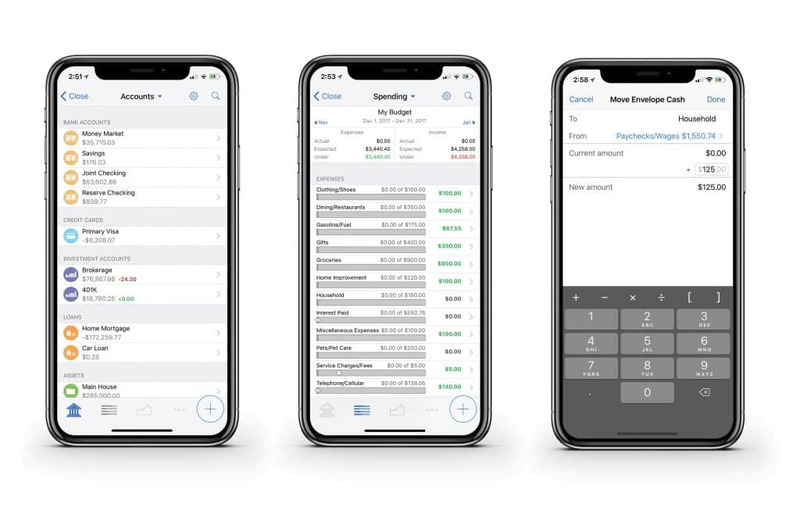 Once you’ve synced your accounts, you’ll receive a holistic view of your finances alongside top notch reporting, goal setting features, and even investment tracking.